HomePod acoustic tests performed by Fast Company and published Tuesday appear to support Apple's claim that algorithms built into the smart speaker make it capable of distributing sound evenly throughout a room. According to Apple's marketing material, music played on HomePod is evenly distributed so that it sounds similar regardless of where the listener is standing or sitting in the room. Apple also claims that HomePod's output remains consistent wherever it is placed in an environment, thanks to sophisticated always-on sound processing algorithms. HomePod uses its six-microphone array to record the behavior of the sound waves emitted by the speakers, while the algorithms analyze the incoming data to adjust the output of the speakers and deliver a consistent representation of a piece of music throughout the listening environment. Another microphone deeper inside the HomePod picks up the presence of walls and other large objects that might interfere with the distribution of certain sounds, like the long sound waves of bass notes, and the algorithms adjust the output accordingly. 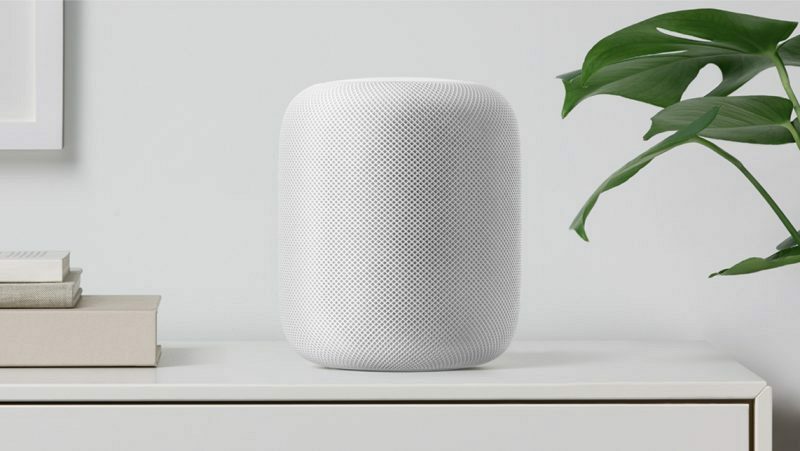 To test the claim, a HomePod was placed on a 30-inch high table by a wall and a white noise test sound was played through it that produces an equal amount of decibels throughout the frequency spectrum. This output was recorded from four locations in the room, and then each sound profile was compared to see how much variation occurred across the full frequency spectrum. The testing gear used in the experiment was loaned by Liechtenstein-based acoustics company NTi Audio AG. According to Brian MacMillan of NTi Audio AG, which provided the testing gear used in the experiment, the HomePod's profile changed very little, with an average variance of less than 0.95 decibels across all audible frequency bands, which is considered below the threshold that can be heard by a human ear. Comparatively, the test team saw considerably more output variation from a Harman Kardon Invoke speaker, which had an average variance of 3.4 decibels. In short, Apple's claim that the HomePod can deliver a consistent representation of a piece of music throughout the room looks truthy. "The developers have done an excellent job of having the HomePod adjust to the room; (it has) impressive consistency in overall level and frequency response," said NTi's MacMillan. "The HomePod automates spatial compensation that previously required a real audiophile's expertise, tools and time," he said. The HomePod's sound has received praise by both new HomePod owners and media sites that tested the device ahead of its release, although Consumer Reports' doesn't believe the HomePod outshines the Google Home Max and the Sonos One. Other reviews have disagreed with that analysis, including an extensive, in-depth review published by a self-professed audiophile on Monday. MacRumours, ffs, will you please stop hyping this thing up. It's a smart speaker with all those limitations. End of story. They're not hyping it, they're sharing information about people who have tested it. Personally I found this article really interesting about the sound distribution. If it was a crap product with terrible reviews then MR would be sharing those too - just because you don't like it doesn't mean positive feedback is artificial hype. It doesn’t really matter what Apple wants to classify it as. To consumers and reviewers, it has all the features of today’s smart speakers except more limited. It’s closer to a smart speaker than anything else. As a studio producer, no it is not. It is as close to a reference speaker than a smart speaker. It does add some color to the sound, so it’s not going to be my flat reference speaker, although I’ve always preferred headphones for that anyway. The speaker will continue to get smarter, but it’s always going to sound about the same. For what it’s worth, I have one, and my studio could use at least 3 more. That wouldn’t be true of any other smart speaker on the market. Consumers are a wide market. This is why a variety of products can exist. You don't understand the story and haven't been paying attention. Apple has said again and again that this is a music device. Smart speaker isn't one they use in describing it. They've actually gone out of their way to avoid lumping it into that designation. It's all about music. 95% of the keynote announcing the HomePod was about music. 95% of the Apple webpage for HomePod is about music. All of the interviews they've done about the product have focused on music and sound quality. How much more clearly does Apple have to put it for you to finally understand that this thing is all about music, not about being a lowly smart speaker? The constant discussions about this thing are starting to get old. But all the reader complaints about macrumors writers covering new Apple products never get old. MacRumours, ffs, will you please stop hyping this thing up. Like when they posted that Consumer Reports review yesterday saying two other speakers sounded better? Okay, can someone really explain this to me. I've had multiple conversations with dannys1 on here and others and I've yet to understand this flat speaker lingo. Some say it's not flat. Others say it's equalized. Apple claims it's balanced, I think. Are all these things the same or different things? Is flat/neutral/EQ/balanced all the same? There are two kinds of "flat" - a measured frequency response test result that produces as close as possible to a flat line on a graph, and the subjective perception that the sound is "uncolored." Well, there's a third kind of flat; uninflected/boring. That's not what we're talking about here. A key goal in speaker design is to keep the speaker system within basic norms (relatively flat frequency response graph), while maintaining an identifiable brand, so that regardless of what speakers were used when producing the sound, it'll still sound reasonably good when played back in the home. "Flat" is nominally a frequency response curve that looks like a flat line, except at the upper and lower extremes of response, where there's an inevitable fall-off in response. Flat, however, is still relative. It's fairly simple to produce flat response in electronics, such as +/- 0.1 Db from 20 Hz to 20,000 Hz. Presuming that transient response is also sufficient (again, fairly easy to do with electronics), that would produce essentially uncolored sound. However, speakers, by their nature, are held to a less stringent standard - say, +/- 3 Db from 20-20K, to allow for dips at crossover frequencies, spikes/resonances due to physical characteristics of cabinet, speaker cones, voice coils, etc., and fall-off at the more extreme frequencies. It's a lot harder to produce "flat" in speakers and microphones than it is in electronics. Engineers and producers like to have a consistent point of reference when moving from studio to studio. They often bring their compact, "flat" reference speakers with them, to compare to the studio's main monitors. When an audio pro talks about a "flat" reference speaker it often means that the speaker lacks noticeable coloration, rather than describing the results of a frequency response test - two speakers with apparently identical response curves can still sound different (which is why subjective listening tests are part of speaker evaluations). This, of course, is a subjective judgement. One engineer's "flat" may not agree with another's. I'd agree that HomePod has a colored sound. I find the coloration pleasing, another may not. Part of the coloration comes from the sound being atypical - highly processed. Since it's an atypical design, that's not a surprise. Unless and until HomePods and speakers of like design are widely deployed in homes, it's not appropriate to use them as a general-purpose reference. Overall, the bass response is what's most remarkable. I'd like a more transparent-sounding high end, but still, it sounds remarkably good for both classical and pop, which is not always easy to do. Violas and cellos in chamber music recordings sound fabulous, rich and well-defined, very close to "live," which is often not the case. This may seem to be a comment on mid and bass response rather than highs, but highs are essential to provide proper definition. I used HomePod last night when watching Wonder Woman on my 12.9" iPad Pro (AirPlay was very easy to setup). That was a mind-blowing experience. The bottom end was comparable (though obviously not identical) to movie theater sound, and for the first time, I was disappointed with the sound coming from that iPad. My only complaint has to do with Hollywood sound mixing practice - they seem to add a fair amount of "bottom" to female voices, which coupled with all the room-shaking low-end sound effects of an action film can make those voices harder to pick out. I encountered the same problem on HomePod as I have in theaters. On the much thinner bottom end of the iPad, voice intelligibility wasn't an issue. My instinct in the studio would be to reduce the bottom end of voices so that the dialog is more intelligible, but nobody in Hollywood is paying me to mix their films. ;-) So, for pure voice intelligibility, iPad wins. For "truth" to the original mix (for good or bad), HomePod wins. The speaker will get smarter? You're basing this on what? Can't be on Siri's progression thus far in it's history. No snark. I've seen so many people say this. Why? Really? A basic understanding of how software evolves over time says that Siri will get better. It's impossible not to. I haven’t heard it yet but I’m sure it sounds great. That has nothing to do with it being a smart speaker though. Google smart speaker. Yes, I know. Thank you for restating my comment in a demeaning way. The most valid point about HomePod is that its software will be updated regularly, and its hardware is a straight up steal at that price point (if you appreciate high end audio hardware). Belittling HomePods software for not being fully fleshed out is outright ignoring macOS, iOS, watchOS, and tvOS before it, all of which started extremely feature scarce especially compared to the competitors who already lead the market. Apples MO is launch a product that does a few simple things seemingly flawlessly and then iterating from there. Enter HomePod.